Here are some bottles that don't garner much love, but are certainly on the scarce side. Fresh from a mid to late 1860's privy, these extracts were a pleasant surprise once cleaned. I am aware of the other western blown extracts such as the Frese and Lows, but I have heard a few others exist. Can anyone explain why clear variants of the same bottle blown around the same time usually have tooled tops while the colored versions are applied ??? Your example on the left is an earlier variant that most likely was blown by S.F.G.W during their first year of production using their glory hole finishing furnace for the neck and top. The example on the right would be a product after S.F.G.W began blowing colored glass which occured after the finishing of their new glassworks in March of 1866. Nice early extracts Andrew! I have an identical aqua example, and have dug an 1860s early tooled ( actually rolled and mashed) clear from the Smith & Davis, Portland, O.it is a yellow coloration. Besides the Redingtons, I have a Gates, Sacramento ( 1870s) and a Guittard, S.F. The 1860s examples are a category in themselves, and tooled tops being earlier than some applied tops seems to be pretty normal. I have dug Pratt's Abolition Oils which are tooled, and are earlier than some applied examples. Warren is right on. Dale M.
Same goes for the earlier Dickey's..... tooled. Nice extracts! Those are tough to find anywhere, and next to impossible to unearth in SoCal, given their early age. I've got a box of different Western extract type bottles. By the 1890s many local druggists had their own private mold extracts made in this same style with indented panels and the loop/ring in the neck (ref: San Jose, Hollister). Langley also had larger-size aqua Eastern-made extract bottles. The rarest Western extract I know of is embossed A.A. Enqvist(with a "v")/California Washing Extract. Alfred Enquist is listed in the early 1860s SFCDs but I haven't found reference to "California Washing Extract" so far. I'm sure there are others out there I've never seen. I've seen the California Washing Extract bottle. Eric McGuire has researched it and has written an article on this bottle & product. It will most likely appear in the Bottles and Extras FOHBC magazine. 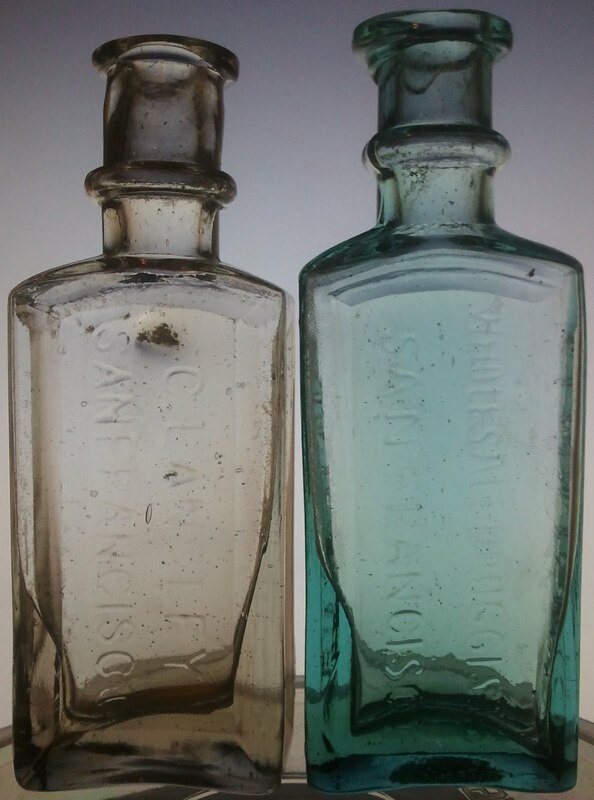 The bottle is likely one of the earliest made by S.F.G.W. I dug a clear Langley exactly like the one on the left in a shallow pit on Humboldt Bay a few years ago. The pit also contained a crude aqua umbrella pontil ink , a double roll lip pottery umbrella and a early whale oil lamp in a lemon yellow coloration with concentric rings wich I think dated to the 1860s . I kept all of the above . I just found a clear C. Langley bottle here in Sacramento along with a few assorted bottles but it was the C. Langley that caught my eye. It is my first time digging for bottles and I have to say I am hooked. Thanks for putting all this great information on here now to go home and clean these bad boys.